The undersides all have the enclosed Wedgwood detail. Wedgwood Charles and Diana Loving Cup Mug in Excellent Condition with Original Boxing. Rare Wedgwood Cream Queen's Ware Dinner Plate. Spotlessly clean. A beautiful Wedgwood blue jasperware fruit bowl with white bas-reliefs. Blue Jasperware Fruit Bowl. The bowl has been previously owned and as shown there is a tiny nick to the rim as shown in the photograph. A Wedgwood blue jasperware plate for the Centenary of Hans Christian Andersen 1805-1875. Blue Jasperware Hans Christian Andersen Centenary Plate. The plate has been previously owned in very good condition. A Wedgwood blue jasperware display plate which features a black print of two Grecian horseback riders. Wedgwood Grecian Horse Display Plate. The plate has been previously owned but it is first quality and in very good condition. A Wedgwood blue jasperware loving mug produced for the wedding of Charles and Diana. The mug is printed on the base 'for the celebration of the wedding of H.R.H the Prince of Wales and Lady Diana Spencer St Pauls Cathedral 29th July 1981 No 801 in a Limited Edition of 3000 Wedgwood Made in England'. A Wedgwood Portland Blue Jasperware Interiors candle holder. Portland Blue Candle Holder. 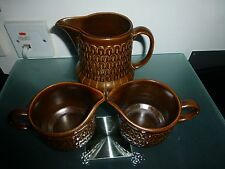 The candle holder has been previously owned but is in very good condition. A lovely piece in good condition for it's age. It is free of chips, cracks and stains but may have minor imperfections such as scratches, trim wear or crazing. I have more of this available and am happy to combine postage for multiple purchases, but please ask before purchasing so please feel free to ask any questions. A Wedgwood blue jasperware pin dish featuring a white bas-relief of Princess Anne. Blue Jasperware Princess Anne Pin Dish. The pin dish has been previoulsy owned but is in very good condition. 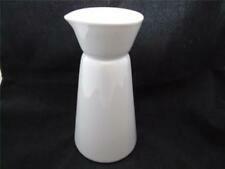 A tall coffee pot in the retro Wedgwood Quince oven to table pattern introduced in 1969 and retired in 1986. Happy to arrange collection and will help where we can. Plate looks in unused condition. The plate has been previously owned but is first quality and in very good condition. 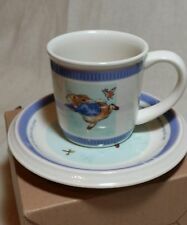 BOTH PIECES are backmarked with PETER RABBIT™ inside a circle and PETER RABBIT ©FREDERICK WARNE 2001 WEDGWOOD® MADE IN ENGLAND. WEDGWOOD - MADE IN ENGLAND. The small mug features Peter in his blue jacket with a friendly robin and the text "Peter ran and ran". 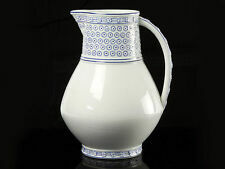 A gravyboat sauce jug in the Wedgwood Oven to Table range Quince pattern. Wedgwood Home Rosebud 2 x Rimmed Bowls Superb Condition 9.1/4""
They are in superb condition. Very very minimal use. A Wedgwood blue jasperware pin dish with a white bas-relief of Sir Winston Churchill. Blue Jasperware Winston Churchill Pin Dish. The pin dish has been previously owned but is first quality, in very good condition. Tri Colour Jasperware Rolls Royce Pendant - Boxed. The pendant has been previously owned but is in very good condition. A Wedgwood footed bowl manufactured in primrose jasperware featuring a white bas-relief. 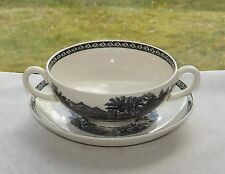 Wedgwood Primrose Footed Bowl. The bowl has been previously owned but it is first quality, and in very good condition. 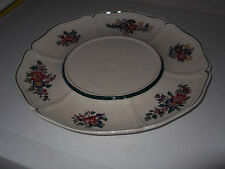 Pottery Wedgwood Green Band Serving Plate 35x28cm. BULK ORDERS. A Wedgwood blue jasperware Blind Mans Buff bowl. Blue Jasperware Blind Mans Buff Bowl. The bowl has been previously owned in very good condition and is first quality. The plate shows around the edge motifs of the original 1776 States. The plate has been previously owned in very good condition and is first quality. A pair of 6.25" tea side plates in the Wedgwood Quince oven to table pattern. Millennium 2000 Art & Music. WedgwoodCalendar Plate Series. A collection of six collectors christmas cabinet display plates produced by Wedgwood between 1980 and 1986 featuring paintings by Alan Price depicting London architectural landmarks. The plate for 1981 is missing. A Wedgwood Portland Blue jasperware pen tray. Wedgwood Portland Blue Pen Tray. The tray has been previously owned but it is first quality and is in very good condition. ENOCH WEDGWOOD. BLUE & WHITE - RIVER SCENE PATTERN. DINNER PLATE. GOOD PRE-OWNED CONDITION. Good condition – minor wear to rim – see pics. Approximate size. WEDGWOOD LARGE QUEENSWARE HARVINGTON HALL FRUIT BOWL. A BEAUTIFUL LARGE WEDGWOOD BOWL DECORATED WITH A PICTURESQUE SCENE OF HARVINGTON HALL IN WORCESTERSHIRE, ENGLAND . 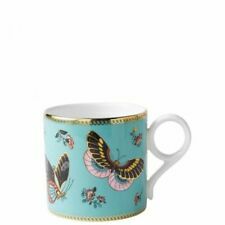 MADE IN THE WEDGWOOD FACTORY IN BARLASTON, STOKE ON TRENT.